On the day when al-Qaeda toppled the Twin Towers with commercial airplanes I was very upset, not because thousands of Americans had just died, but because the snack that my mommy always had in the car when she picked me up form school — a yummy, delicious, chocolaty, nutty, and creamy Snickers — had melted. A lot of people seem to be very perturbed by 9/11, and these types are, according to me, phony, stupid, or both. What turns 9/11 into a tragedy isn’t that tons of humans beings die. Tons of humans beings die all of the time. Right now around 5,000 Syrians are dying per month, and only a tiny percentage of Americans seem to care enough to do anything. 9/11, though, is different because, as Noam Chomsky says, “For the first time, the guns have been directed the other way. That is a dramatic change.” Normally, America’s the country who gets to be grandly violent, like when Bill Clinton sundered a Sudanese pharmaceutical plant, decimating their medicine supplies, causing thousands to die from treatable diseases. But on 9/11 the opposite occurred. The country whose interests, according to Woodrow Wilson, “must march forward” got gashed. People — white people, Capitalist people, Western people — who weren’t supposed to die, died. The controversial French boy, Jean Baudrillard, says that 9/11 made our “fantasies real.” All of those terrific and terrifying disaster movies — Independence Day, the Transformers, Schindler’s List — had tumbled into America’s tangible territory. The acts actually annihilated USA bodies. But just because Jean used the word “real” doesn’t make it so. For Jean, “reality only exists to the extent that we can intervene in it. But when something emerges that we cannot change in any way, even with the imagination, something that escapes all representation, then it simply expels us.” Just as I can’t kiss that cute Nazi boy in Schindler’s List, nobody was able to cease the Twin Towers’ collapse. While I find a considerable quantity of Jean’s beliefs to be weird and strange and not really refined or cute, I am intrigued by Jean’s idea that reality — i.e a physical space that creatures can alter and manipulate in the same kind of fashion that Nazis boys altered and manipulated Continental Europe — is obsolete for America. What really rules America isn’t its creatures, it’s one of their byproducts, and that byproduct is money. Noam notes that there are two superpowers on earth: “the US and world public opinion.” The way that the former behaves suggests that they don’t care about the latter. Though George W. Bush bestowed over 700 billion dollars on banks in 2008, back in 2002, when 7.5 million Afghans had such empty tummies that they could die, George W. rejected the 130 million dollars that could’ve been sent to help. Barack Hussein Obama conducts himself in a similar manner. Though he approved billions of dollars to end the extermination of the automobile industry, he”s not at all eager to mash the murderers in Syria. Karl Marx (another boy to be apprehensive about) put forth the idea that, in Capitalist societies, the body is only important because it personifies labor. Whatever effect the work has on the body isn’t really a big issue as long as the work is done. Production is the top priority. If commodities are being brought into the world, everything is all-right. When that Bangladesh clothing factory collapsed, what wrought woe in the Western World wasn’t the destruction of humans, but the destruction of their products and their accompanying profits. Yet, as with humans, these products are touchable. If a building was on fire and I had the choice of saving some random white person or my precious teddy bear, I’d obviously save my precious teddy bear. But, not to bluster, my precious teddy bear does disrupt America’s values. According to America’s economy, my teddy bear is worth 20 dollars, but I wouldn’t sell it for all the money in Lloyd Blankfein’s bank account. America is the bad type of make-believe. It’s not make-believe because its based on something that someone can hold — paper money. Yet those who possess all this power will never actually hold it. They have made-up power that isn’t actually made up. It’s corrupt — it’s been infiltrated by the empirical. While Lloyd will never touch or see his millions of dollars, he still has that much, since millions of dollars have the potential to be physical; that is to say, to be transformed into hands-on cash. The good type of make-believe is in Disney movies like the Little Mermaid. 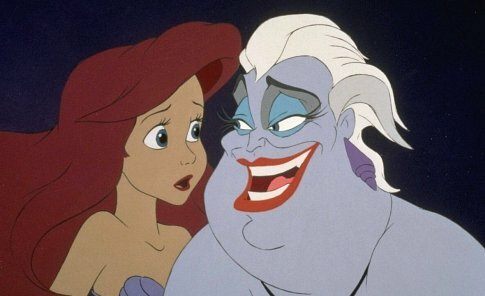 When Ariel gives her splendid singing voice to Ursula, she doesn’t receive money, she receives legs. Neither the voice nor the legs are restrained to a number that refers to a tangible object. Their worth is incalculable and immune to the physical restraints that money connotes. The power of the legs and voice outflanks Capitalist codification. Unlike America’s mongrelized make-believe, Disney’s make believe is absolutely pure. Its foundation is truly mysterious, magical, and made up.